My dad and I tried out Matsuri for lunch today. It’s located along Tomas Morato in the area that used to be Jozu. 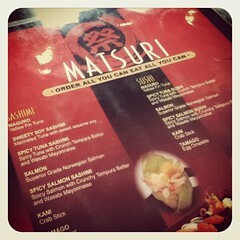 Owned by the same group of people, Matsuri offers Order All You Can, Eat All You Can Japanese food. If you’re used to Jozu, the food they serve is the same except that you get to order a LOT of it without worrying about the cost. For Mondays – Fridays Lunch, the price is PHP495.00 while for Dinner and other days, its PHP595.00. 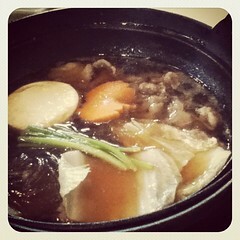 The food seemed to taste the same as Jozu. I still like their Kamameshi rice. 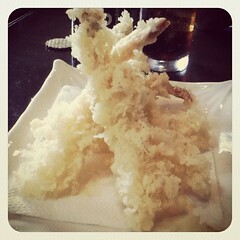 Their Tempura is still good. Servings are the same as a full sized order. The problem with the restaurant though is that the food TOOOOO long to come out. It took at least 30 minutes before our Salmon Sashimi, Tempura Crunch, and another Sushi came out. It took another 15 minutes before the other dishes came out after that. My dad threatened to cancel the orders already since it was taking them too long to serve SUSHI. Anyhow, here are pictures of what we had. Photos were only taken using my iPod Instagram.